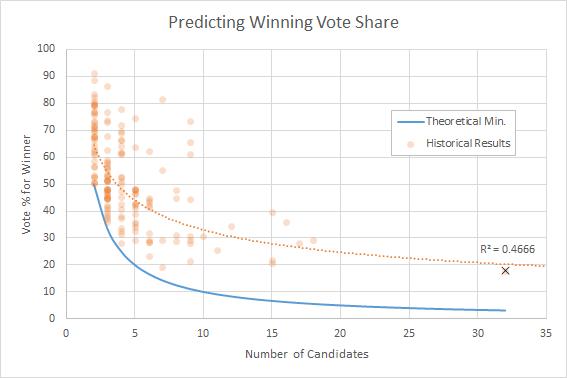 Obviously it was a long shot extrapolation, as very few past elections have had even half the number of candidates as this one. I'd say that looks pretty decent. Sure, it was a long shot estimate, but it was certainly a lot less dire than the worst-case guess would have been. Sadly, because of its by-election status, there were only seven polling stations in this election, which means that mapping voting data is a bit silly. Here are the results of the winner in each poll anyway, though. Again, not much to write home about. This map is a lot more boring than it could have been largely because all the vote totals tend to be quite close together, and each poll represents several neighborhoods. 7 data points just isn't enough to have fun with. That being said, we can see that Moe Banga had fairly wide-ranging support, which will be encouraging for him going into council. Irfan Chaudhry, who came in fourth, had a narrow lead in Charlesworth, Walker, and Ellerslie neighborhoods, and Laura Thibert, who came in second, had a decent lead in Larkspur and Wild Rose. Finally, when we look at the total vote breakdown a little more closely, we can get a bit of an idea as to how some of the campaigns prioritized. Take advance voting, for example. Advanced votes accounted for 27.3% of all votes cast, but were prioritized by some candidates more than others. Moe Banga, the winner, was clearly quite organized and got 37% of his vote in advance (these advance votes of his were enough to beat the total votes of 26 other candidates even). Other high-ranking candidates, like Balraj Manhas, Arundeep Sandhu, Yash Sharma, and Rakesh Patel all got over 35% of their vote in a similar way. Candidate Sam Jhajj was a clear outlier though - getting 70.3% of his votes from advance voting. And finally, special ballots only accounted for 1.1% of all ballots, and are reserved for people who can't vote in either advanced or normal ballots. Strangely enough, three candidates (Moe Banga, Rakesh Patel, and Balrash Manhas) combined had more than half of these votes. Kudos for grabbing the out-of-towners, I suppose! That's it! And we won't have another election in Edmonton for 18 months! See you after the next one. That was the lowest percentage of votes a winner should need. There must be at least 20-25 percent for the winner as Michael mentioned in his tweet about the elections.